Buy Directly from Chelsea Green, an independent employee-owned publisher. 35% off everything at the site with the code: cd2016. Code is good for multiple uses, but cannot be combined with other discounts. CREATIVE, PRODUCTIVE GARDENING FOR GOOD TIMES AND BAD. In an age of erratic weather and instability, people's interest in growing their own food is skyrocketing. The Resilient Gardener presents gardening techniques that stand up to challenges ranging from health problems, financial problems, and special dietary needs to serious disasters and climate change. Scientist and expert gardener Carol Deppe draws from emerging science in many fields to develop the general principles of gardening for resilience. Gardeners will learn through Deppe's detailed instructions on growing, storing, and using the five crops central to self-reliance: potatoes, corn, beans, squash, and eggs. 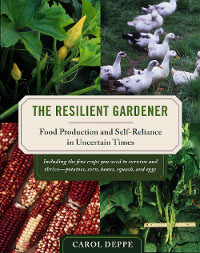 The Resilient Gardener is both a conceptual and a hands-on gardening book for all levels of experience. Optimistic as well as realistic, Deppe offers invaluable advice for gardeners (and their communities) to flourish.